My friend Terry Elliott, a professor at Western Kentucky University, sent me this Washington Post article, which is titled "Six maps that will make you rethink the world." I encourage you to read the article, look at the maps, and spend some time in deep thinking and conversation with others about what the maps of the world will, or should, look like in the year 2100. These maps show population changes, growth of cities, and environmental changes taking place over the next century. 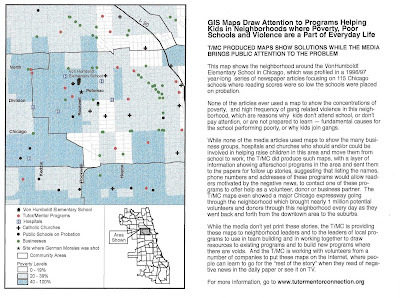 Since 1994 when I first started using maps, I've focused on Chicago, and highlighted high poverty areas with my maps. However, I've also suggested in many forums that there ought to be a world map that shows areas of poverty, or other issues, and that supports deeper learning and discussion by people throughout the world that leads to better management of these changes. In this link on my web library I point to some of the sites I've found. I'm sure there are more. 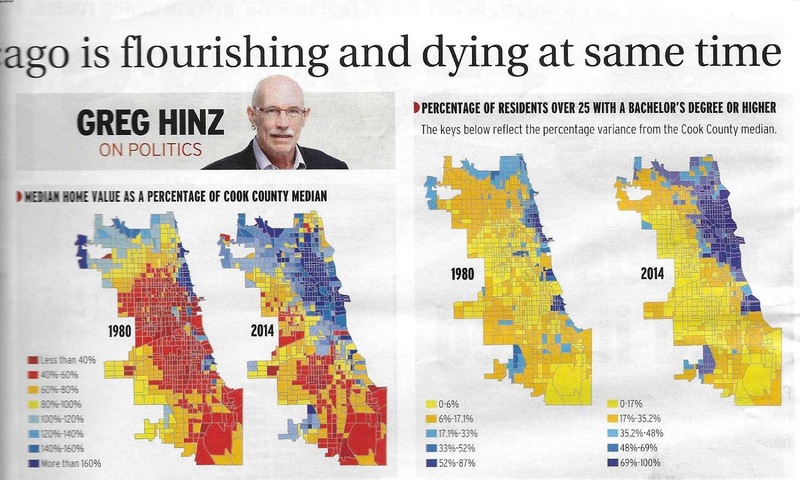 These maps can be seen in this article written by Greg Hinz, in the 6/13/2016 issue of Crain's Chicago Business. I wrote about this today in this article on the Tutor/Mentor Blog. Last fall I shared a tutorial for using NodeXL to show participation in Twitter conversations. 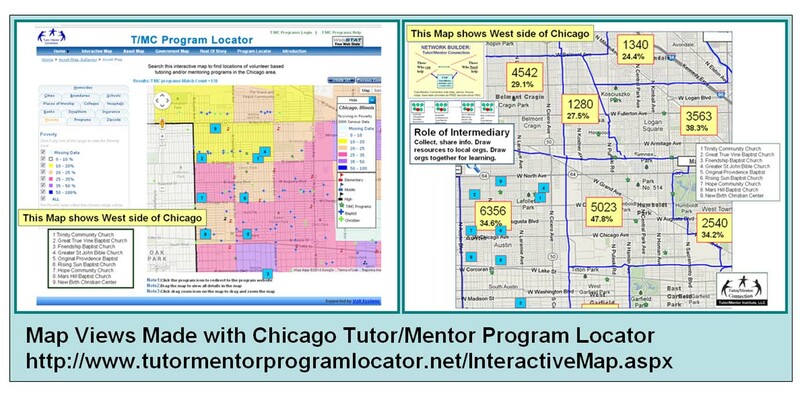 Then, I created a this map and article showing participation in the Mentoring Summit last February. 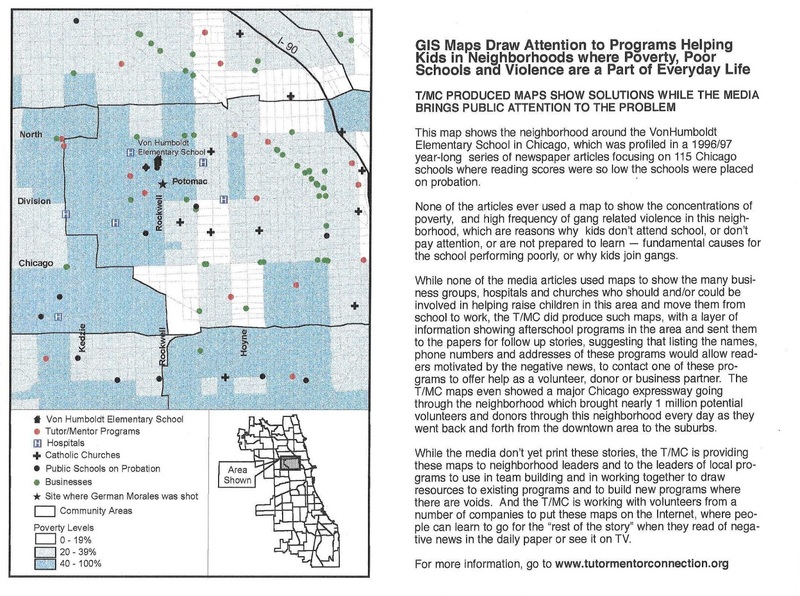 In May 2016 I created another map and article, showing participation in The #onthetable2016 event hosted by The Chicago Community Trust. Today I'm sharing three maps, which show participation in two important conversations held on June 8, 2016. One was a #promisechat hosted by the America's Promise organization, created following the 1997 President's Summit for America's Future. The second was an #Educationdisparities chat, hosting by the Brookings Institution. These were back to back, one starting at 1pm CST and the other at 2pm CST. The maps below show participation in each event, then show participation in both events. This shows the crossover of people who participated in both, such as myself. There's much that event organizers can do using these maps, to understand who they are reaching, and to plan future events that recruit more who need to be involved in these conversations. There's also much that anyone using Twitter can do to learn who the major influencers in each conversation are, and to reach out and begin to build a relationship by following them. I want to thank Marc Smith and NodeXL for creating these maps for me at no cost. 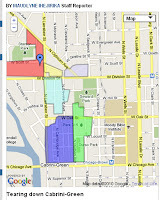 Connected Action creates maps for business users for a $79.95 per map fee, and they offer discounts to registered non-profits. Interested organizations are encouraged to request a few sample network maps and reports to understand their value and application. Click the http://www.connectedaction.net/shop link to learn more about their work and how you can begin to obtain maps like these. Use the coupon code sna4nptmi and receive a non profit discount. The first 50 to use this code will receive their first two maps for free. Other links to view to learn more. For those who may be interested in learning more about network analysis and tools they might use, here's one article you might look at. If you want to dig deeper, this link points to a site where I've aggregated a few more article to read.. 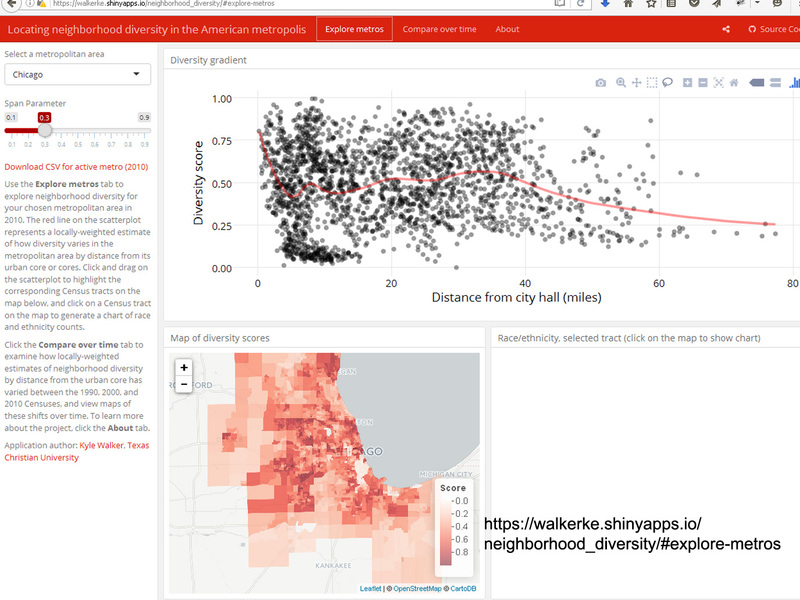 Here's a map platform that enables you to look at diversity patterns, at the city level. In the "about" section on this site it says "This application is in support of the article in Urban Studies, “Locating neighborhood diversity in the American Metropolis.” The article analyzes geographic variations in neighborhood racial and ethnic diversity over time in large metropolitan areas in the United States." 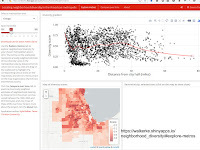 Combined with other map platforms, readers and activist can build an understanding of where poverty and segregation are most concentrated in Chicago and other cities. 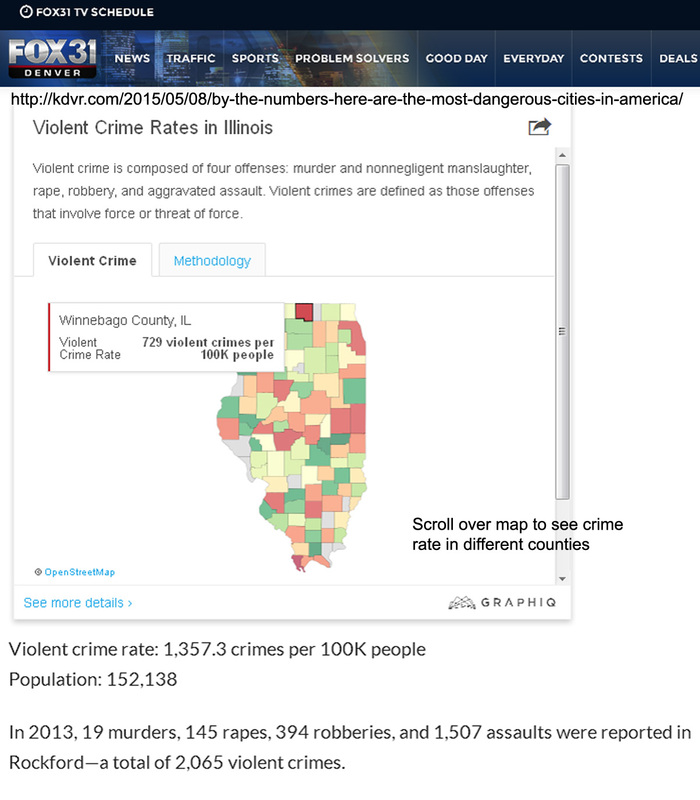 This May 2015 story shows the 20 most dangerous cities in America, and includes a map of each city showing the highest crime areas in each city. While Chicago gets a huge mount of media attention for it's violence, it is not on the list of top 20. I've shared information about the Tutor/Mentor Connection with people in cities on this list, starting in the mid 1990s, with the goal that other cities adopt the T/MC strategy. These include Rockford, Milwaukee, Detroit and Indianapolis. Between 2000 and 2004 I developed a relationship with leaders at IUPUI in Indianapolis, that aimed to fully duplicate the T/MC in that city. IUPUI never found the money to do that, but a show of their commitment was the hosting of an on-line conference (2004 or 2005) to parallel a Tutor/Mentor Leadership and Networking Conference in Chicago, and the rebuilding of the http://www.tutormentorconnection.org web site in 2005 by members of their technology department. This strategy is still available to these and other cities. You can browse through my web sites and borrow the ideas. You can assign student research teams to dig into the sites and report what I'm doing that could be duplicated. You could hire me as a consultant. Want To Reduce Violence, Inequality? One of the challenges to solving complex problems is building and sustaining public interest and involvement. Most non profits, particularly smaller ones, don't have advertising dollars to use to attract attention the way most for-profit businesses do. 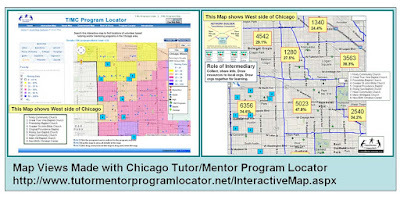 Thus, one strategy piloted by the Tutor/Mentor Connection in Chicago, in the mid 1990s, is to create map-stories, that follow negative news, and point to places where volunteers and donors are needed to support tutoring, mentoring and learning strategies. I've modeled this by dozens of articles on this blog and the Tutor/Mentor blog. However, unless many others create their own map stories, and point links to me and others, we won't have the reach and frequency needed to build attention and motivate actions. Thus, this graphic is a reminder that you and anyone else can create and share similar map stories. Here's a PDF essay that s hows how you can create your own maps. If you're doing this, share your blog address in the comment section so that other readers can be inspired by the work you are doing. 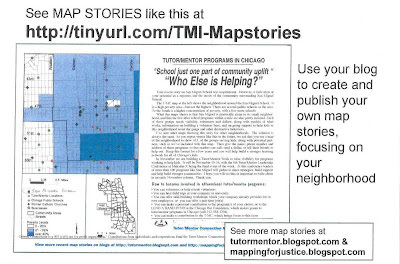 Below you can see another map created by the Tutor/Mentor Connection in the mid 1990s with text that shows how we have been trying to use maps to draw support to tutor/mentor programs in high poverty areas of Chicago. It's a strategy that can be duplicated in any city. 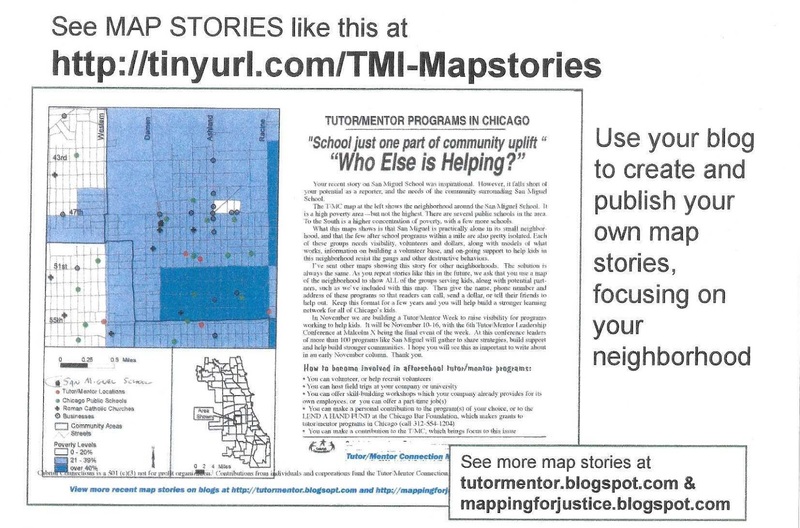 Here's another PDF essay, showing how you can create map stories following stories in local media that are drawing reader attention to problems caused by high poverty and too much inattention from people who don't live in poverty. If you're a writer, artist, or YouTube creator, I encourage you to hack my articles and create your own interpretations, sharing them with me, and with your own network. Note: Since 2011 the Tutor/Mentor Connection has been operated as a program of the Tutor/Mentor Institute, LLC. In many articles on this blog I show how maps can be copied to Power Point, and additional data added. Then the maps can be copied to PhotoShop and saved as a JPG used in future blog articles. Below is an example. 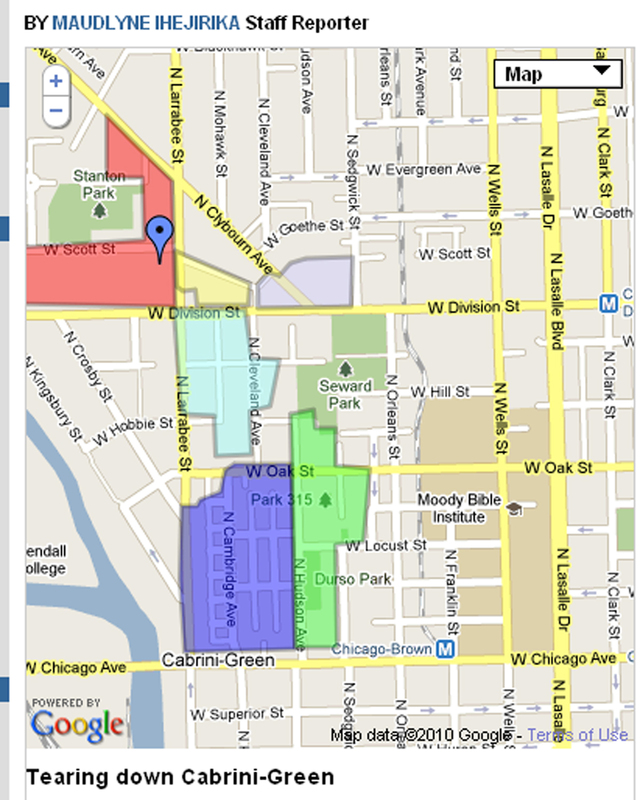 If you want to use Chicago Police District boundaries as your base map, here's a link to the City of Chicago site. 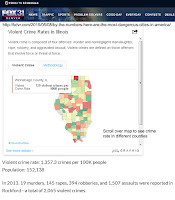 Here's a link to a map showing Chicago Police Beats. Thank you to Josh Kalov for sharing this link on a #chihacknight page.